I hope everyone had a wonderful Easter yesterday! I had a weekend filled with Easter celebrations with family and friends, which was so nice. There is nothing better than being surrounded by the people you love. Easter is such a beautiful holiday and one that is filled with so much meaning to those who celebrate it. 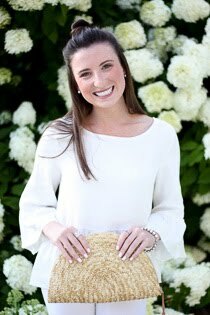 I have such fond memories from my childhood of Easter celebrations with cousins, Easter egg hunts, decorating eggs, and of course getting all dolled up for Easter Sunday mass. My mom used to go all out with my sister and I - dressing us up in the most beautiful Easter dresses with bonnets. Although we lost the bonnets years ago (thank God), I still love to get dressed up on Easter. It is a tradition I am sure will live on for the rest of my life. Thankfully yesterday was a beautiful spring day here in New England. 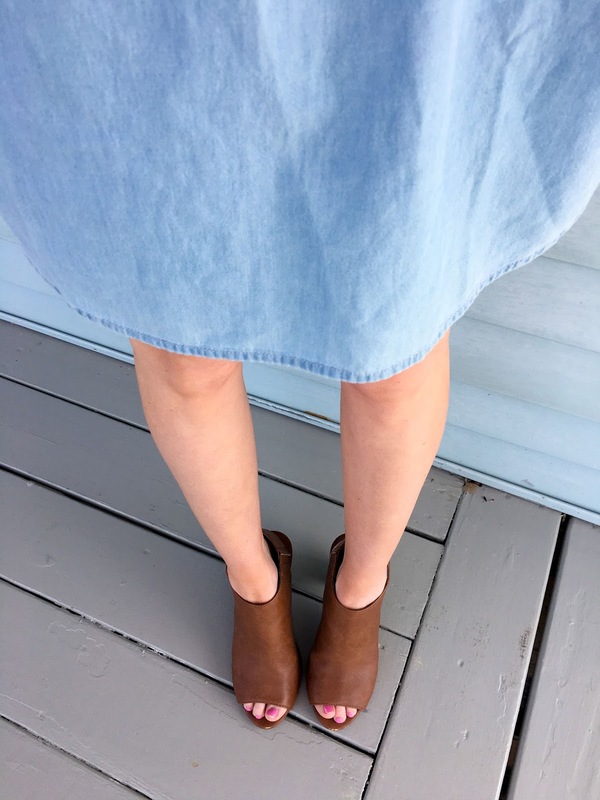 I have been dying to rip the tags of of this chambray dress, and I was thrilled that the weather allowed me to yesterday. It wasn't the warmest of days but the sun was shining, and in the spirit of Easter, I decided the dress was making it's debut. At this point not much can stop me from breaking out the spring dresses. 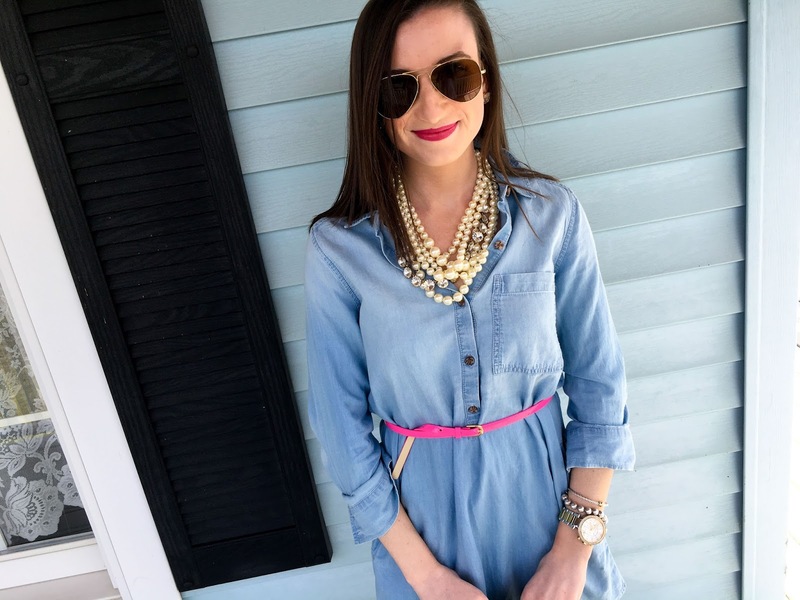 It is officially spring and I am going to dress like it! I found this dress a few months ago at Forever 21, and it was such a steal that I just had to get it. I wasn't able to find the exact one, but there are quite a few similar ones here, here, and here on their website! I also did this post last month all about chambray dresses - definitely check it out for more options! 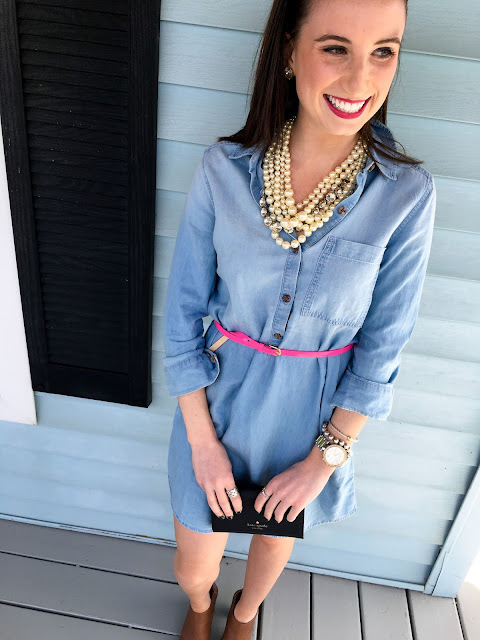 What I love so much about the chambray dress is that it is so versatile and can be dressed up or down depending on the look you're going for. I obviously dressed it up a little bit, but the look was still fun and casual. I layered this multistrand pearl necklace with this crystal necklace, along with my everyday jewelry. The belt is completely optional, but I liked that wearing it belted gave more shape to the dress. Not only that, but also a nice pop of color! 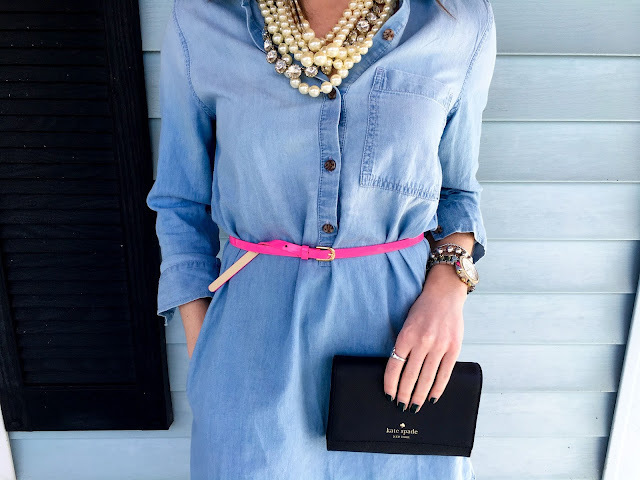 The belt I'm wearing is old, but here is another fun alternative. To complete the look I threw on a pair of peep toe sandals, which again are from last year, but I am loving this similar pair from Steve Madden. Final touches included a berry lip and this adorable Kate Spade clutch. It is actually a cross-body, but because of a detachable strap it functions as both. Multi-function items are a win in my book! Hope everyone is having a lovely Monday so far and your week is off to a great start!